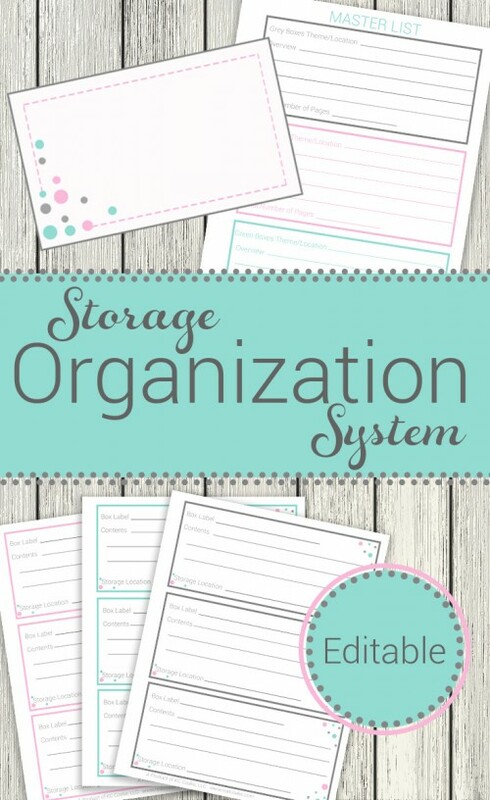 How about some organization fun today? I love being organized! It just helps me feel more clear headed. Last summer, I went through all of our items in our storage areas and got everything organized. While I was working on my own house, I created a storage organization system and I'm sharing it with you. Yay! When we moved into our house 7 years ago, I was due to have Pumpkin 12 days later via c-section. I didn't care about what boxes went where. I just wanted to get mostly unpacked and settled in those 12 days because I knew I would be tired and post surgery in 12 days. A lot of boxes just went into the attic or shed to be dealt with later. Later came 7 years later….a LOT longer than I had planned. I wrote about my disgustingly messy house during my process of cleaning all the boxes out (which you guys sure seemed to like seeing my mess). As with any organization project, you will want to start by taking everything out that you are working on organizing. Everything… yep. This is a disaster. Next, you will want to purge. Be ruthless and get rid of everything you don't love or that doesn't have a specific purpose or use in the near future. 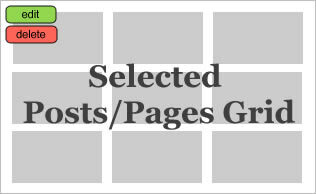 Then sort items together by groups or categories. Figure out how you intend to store those like items. I really like the plastic bins. They are easy to store things in and keep things clean regardless of where you are storing things. 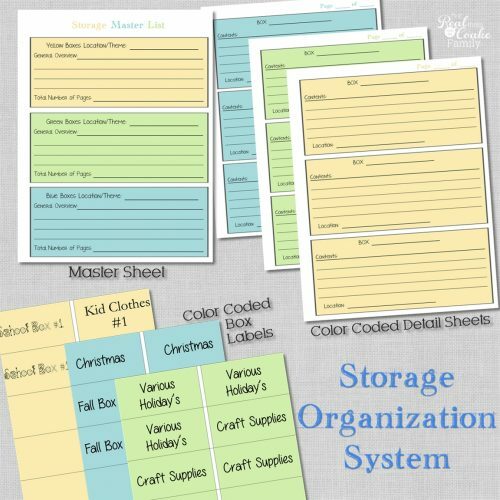 The picture above is from my new Holiday Storage Organization System which is great for storing all your holiday decor items, but they look just like the new Storage Organization System sheets as well. 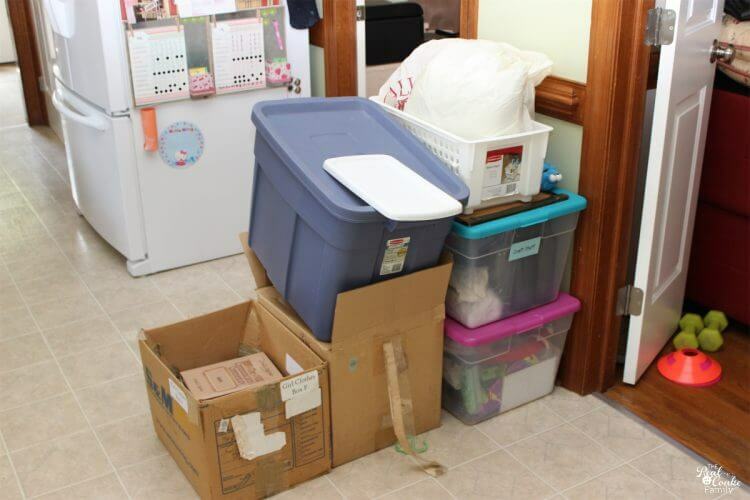 As you store items, you will want to catalog what you have and where it will ‘live.' That way when you are looking for that science textbook from college or those baby blankets or kid's clothes in the next size up, you will know where you put them. 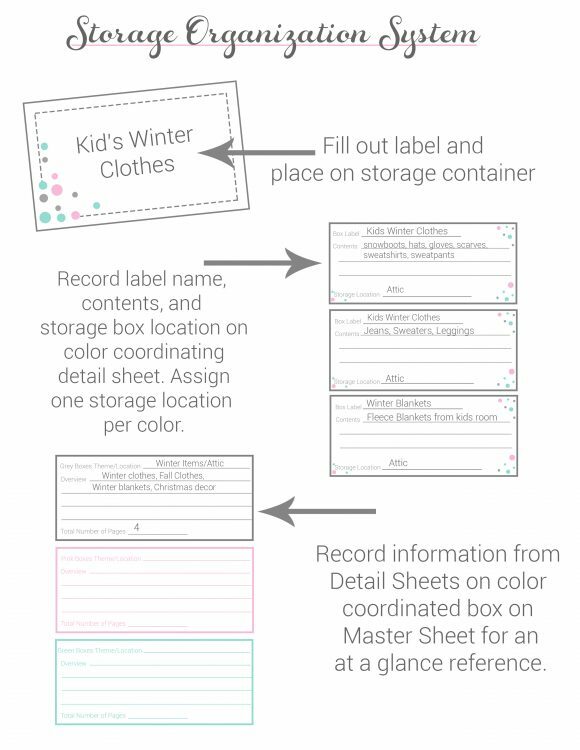 The Storage Organization System has a master sheet that allows you to list the boxes that are stored in that location. This may not be an issue for you if you only have one storage location. In our current house, we have a small shed and our attic as our primary locations that we store things. So, I need to know which location I'm going to find those clothes in the next size up. Next up, you will want to label your boxes and fill in the specific details of what is in that box. Once again these pictures are from my Holiday Storage Organization System, but they look the same in the Original Storage organization system minus the cute holiday graphics. (affiliate link). 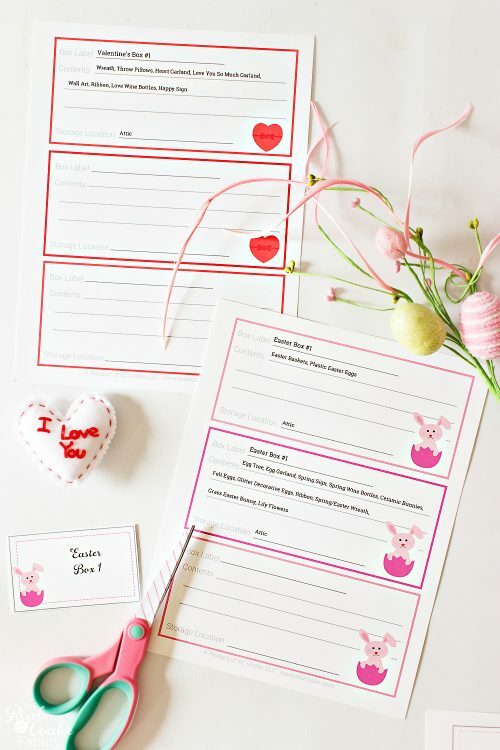 Cut them apart and label each box with the same name you entered on the detail sheet. The labels look different in the new Storage Organization System. They are so much cuter and they are still color coded for color coding your multiple storage locations. PRO TIP: Label each box on at least 2 sides. 3 is even better. That will allow you to see the label for that box no matter which direction you end up needing to put it in the storage location. Now take a look out our shed! It looks great and so organized. 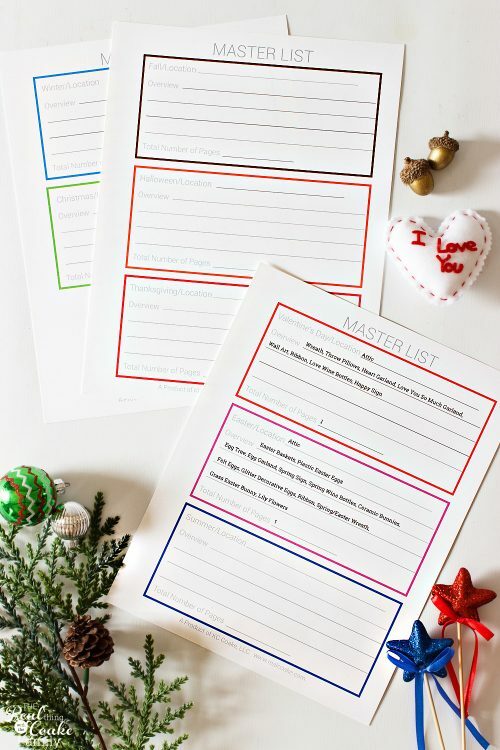 When I need to find something, I am able to quickly and easily know where to find it by using my master list and then my detail sheet. It is also so easy to know where to put it away when I am done because I have the areas in our house in which we store things color coded. I'm telling you, I LOVE the Storage Organization System. It has helped me so much in the time since I created it. The newly updated look is sleek and modern. Love it! 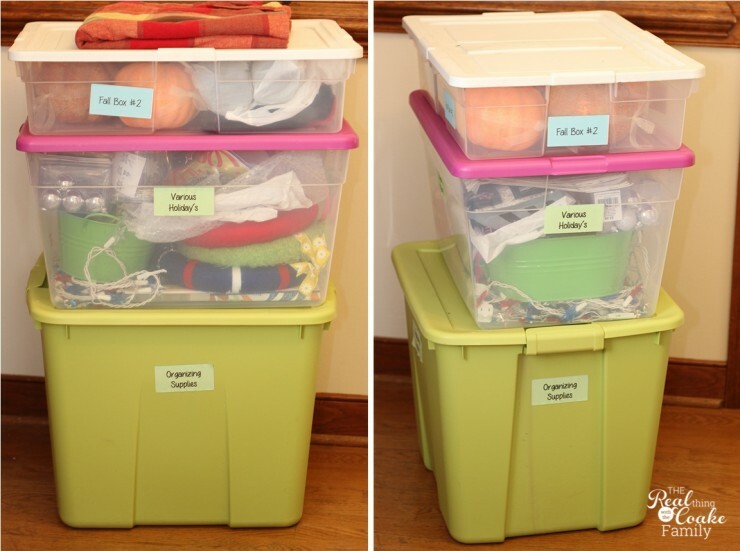 Snag your Storage Organization System by clicking that link. 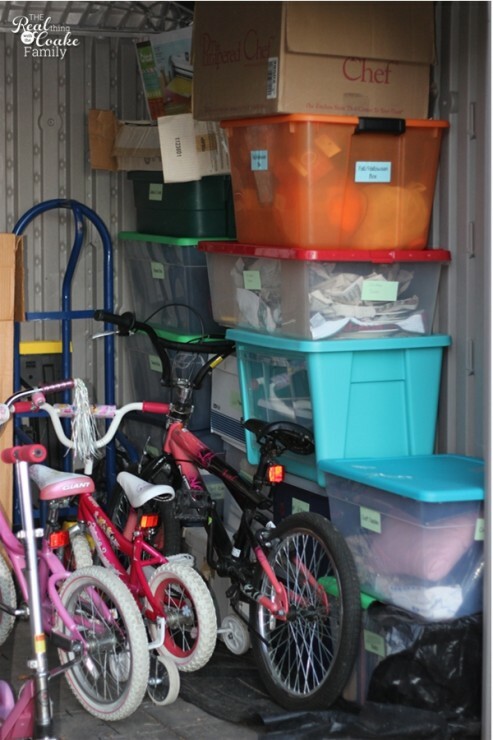 If you are interested in learning more about the Holiday Storage Organization System, click that link to read more or click this link to buy it. You can also snag both in my great deal of a combo package! Yay! Have fun organizing! 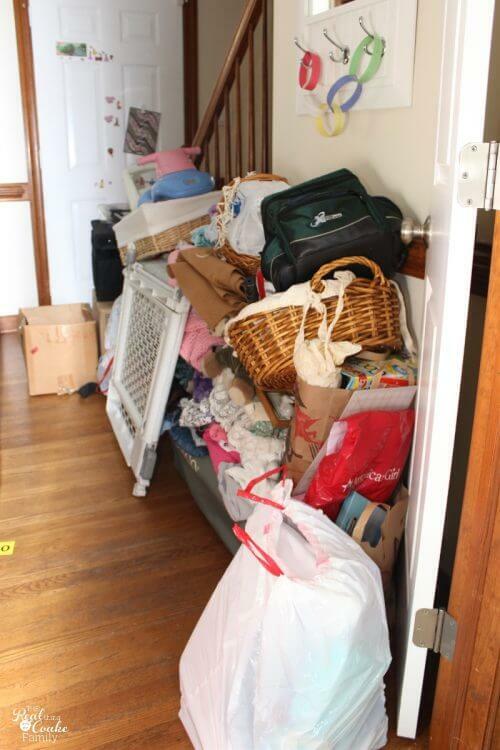 Do you have storage organization issues at your house? How did you solve them? Awesome! I could really use to get my own self in gear and do some organizing like that 😉 We just moved to our house before the holidays and to say that home-management was put on the backburner is an understatement! Yes, well at least your move was only a month or so ago. It took me 7 years to get myself organized. You will get there. 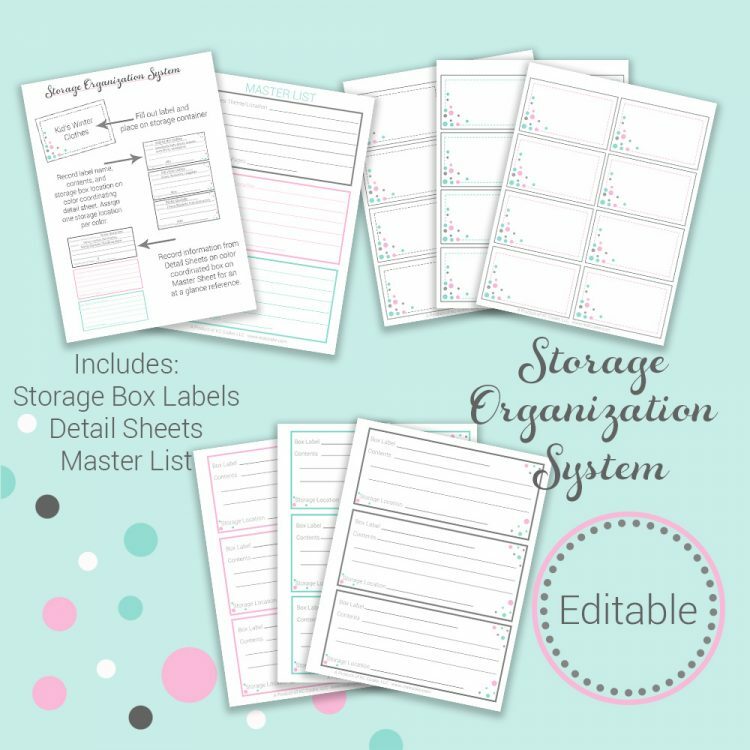 Hopefully you enjoyed the holidays and now you can slowly but surely get things organized. Mr T: You need to get the training wheels off and set Pumpkin free!! Have fun! I will pass the message on to him, Dad. She does need to and we need to get her a bigger bike. She has outgrown this one. Perfect timing! I’ve been trying to get better organized. This is… wow. So glad it is perfect timing for you! It has been working well for us and I hope it works fantastically for you. Hi, Where’s the box I’m supposed to click on to get this great storage organization system? If you scroll to the end of the post, you should see a pink box that says, “Get Organized Now.” Just click on that and it will walk you through the process. If for some reason, you can’t see that pink box, let me know and I can get you a direct URL to the item in my shop. Alas, I do not see “Get Organized Now” box that you refer to. In advance, thank you for taking the time to forward the URL to me. Isn’t it amazing that we all have so much STUFF that we need a paper trail to keep track of all of it. I’m probably the worst offender of the ‘keep it’ brigade. I’m grateful that we don’t have a basement or outdoor shed to house more stuff! They’d probably be stuffed! I’m moving into the phase of removal. I’ve moved all of our digital pictures to the cloud to get rid of all of those CD/DVD’s I’ve collected (baby steps!). The other photo’s are all in albums (not scrapbooks really, just organized by date or my daughters age). Now I’m on a quest to just get rid of stuff I don’t think we will ever need or use. The yarn collection (I’m an avid crocheter) is down by half. Not sure I’ll make that much progress on the quilting fabrics, but I’ll try. Next year I’m going through all of the Christmas stuff and trying to cut that down some. The medical supplies I needed while convalescing from a broken foot need to be dealt with (the walker, the shower bench, etc) will probably just donate to the local Salvation Army.Seems like alot of this ‘stuff’ ends up in the garage-so that needs a good going through. My biggest hurdle: DON’T BUY IT, look in the garage! You are so right! I love weeding things out as well. It feels so good. Yet, at the age my kids were when I wrote this post, saving some things just made sense. Saving clothes for the next child or homeschool curriculum for the next child makes so much financial sense. I also have tons of decorations for all seasons. Fun! Being able to quickly and easily find them saves me money as well. All that being said, I totally agree with you on getting rid and not buying unless we really need it.